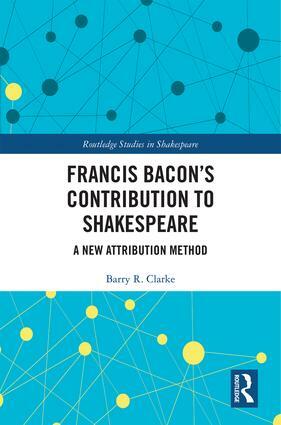 Francis Bacon's Contribution to Shakespeare advocates a paradigm shift away from a single-author theory of the Shakespeare work towards a many-hands theory. Here, the middle ground is adopted between competing so-called Stratfordian and alternative single-author conspiracy theories. In the process, arguments are advanced as to why Shakespeare’s First Folio (1623) presents as an unreliable document for attribution, and why contemporary opinion characterised Shakspere [his baptised name] as an opportunist businessman who acquired the work of others. Current methods of authorship attribution are critiqued, and an entirely new Rare Collocation Profiling (RCP) method is introduced which, unlike current stylometric methods, is capable of detecting multiple contributors to a text. Using the Early English Books Online database, rare phrases and collocations in a target text are identified together with the authors who used them. This allows a DNA-type profile to be constructed for the possible contributors to a text that also takes into account direction of influence. The method brings powerful new evidence to bear on crucial questions such as the author of the Groats-worth of Witte (1592) letter, the identifiable hands in 3 Henry VI, the extent of Francis Bacon’s contribution to Twelfth Night and The Tempest, and the scheduling of Love’s Labour’s Lost at the 1594–5 Gray’s Inn Christmas revels for which Bacon wrote entertainments. The treatise also provides detailed analyses of the nature of the complaint against Shakspere in the Groats-worth letter, the identity of the players who performed The Comedy of Errors at Gray’s Inn in 1594, and the reasons why Shakspere could not have had access to Virginia colony information that appears in The Tempest. With a Foreword by Sir Mark Rylance, this meticulously researched and penetrating study is a thought-provoking read for the inquisitive student in Shakespeare Studies. "Bacon throws a weird shadow over it all, although the detailing is very attractive, and the RCP tests are quite persuasive. [The Tempest chapter is] a perfect account of the story. I’m sure that Bacon was a lot closer to Shakespeare than most current accounts allow him to be." Barry R. Clarke has a variety of interests. He has a Ph.D. in Shakespeare studies with peer-reviewed publications on The Tempest. His scholarly publications in quantum mechanics have led to an academic treatise The Quantum Puzzle: Critique of Quantum Theory and Electrodynamics (2017)which sets out a new theory of the mass vortex ring. There are also books on recreational mathematics for Cambridge University Press and Dover Publications, while Challenging Logic Puzzles Mensa (2003) is an amazon bestseller. He is presently puzzle compiler for The Daily Telegraph and Prospect magazine (UK). Viewers in the UK might have seen both his puzzle work and his comedy sketches broadcast on both the BBC and ITV.